This ghasghase payasa or khuskhus kheer or poppy seeds kheer is a south Indian recipe. 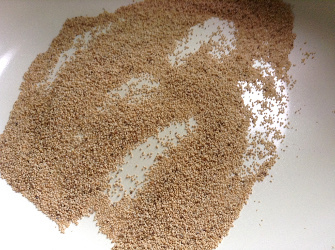 Khuskhus(Hindi, Marathi) or gasagase(Kannada) are the Indian names for poppy seeds. Khuskhus kheer is made in other regions too. This is so easy to make, there is not much possibility of spoiling it. 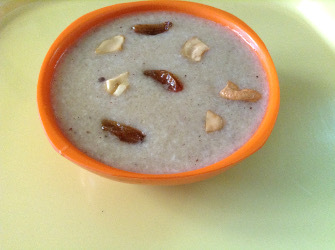 Though it can be made for any festival, it is a special kheer for Gauri and Ganesh festival in Karnataka. 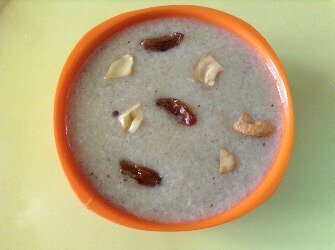 This is generally a thin kheer and is served in a glass, but you can make it as thick or thin as you like. Water - 2 to 3 cups or as per your desired consistency. In a fry pan, dry roast khuskhus on low flame till it gives aroma but do not let it brown. 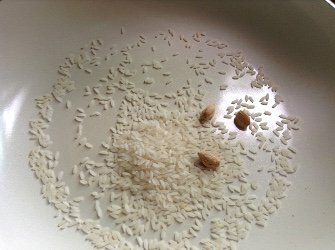 Add rice and cardamoms (if using whole) to the pan. Stir and mix. 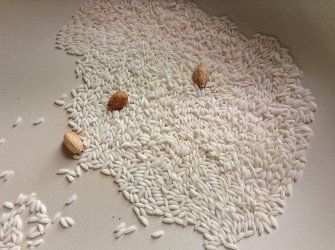 This is how rice will look after being roasted, in the image below. Let cool completely. Grind to a fine powder the khuskhus, rice mix. 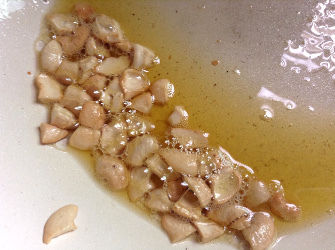 Add fresh coconut and some water and grind some more to make a fine paste. 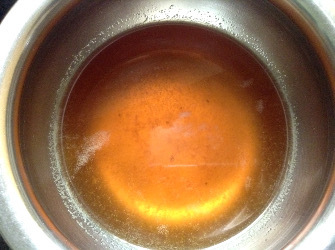 Put jaggery and 1 cup water in a pan. 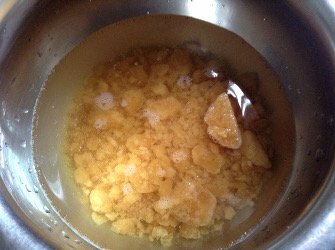 Heat and stir till jaggery melts completely. Remove any impurities of top with a spoon. 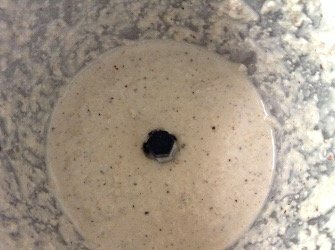 Strain in another pan, mixing with the ground poppy seeds paste. Check the consistency. Add more water if needed. It will thicken a little as it cooks. Stir once in a while to make sure that the bottom doesn't burn and there are no lumps. Bring to boil. Boil for 5 minutes. Add more water if necessary. 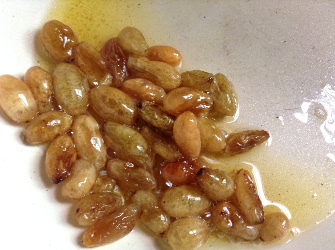 Roast the cashew nut pieces and raisins in a little ghee. Add the roasted raisins and cashew nuts and the cardamom powder to the boiling kheer. Switch off. Ghasghase payasa or the khuskhus kheer is ready to serve. It can be served along with a festive meal. It can be served hot or at room temperature or chilled in the fridge. 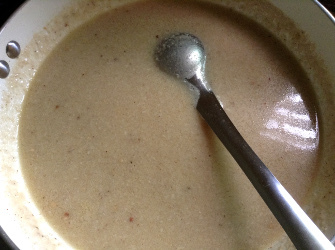 Roasting poppy seeds/ gasagase properly adds to the flavor of this kheer. Grinding gasagase / poppy seeds to a fine powder before adding water is important. If you add water earlier, you may not get a smooth paste. You may use more coconut if you wish. You may use sugar instead of gud - jaggery. Milk may be added instead of water in the final boiling or just before serving. You may also put it in the fridge and serve it cold. It stays good in the fridge for 2-3 days. If you make it thick, serve it in a bowl with a spoon. If you make it thin, it may be served in a small glass or a cup. 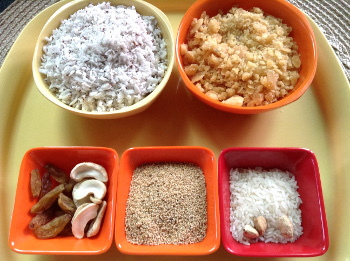 Instead of rice, rava (sooji / semolina / cream of wheat) may be used. If using rava, add it at the end when the kheer is boiling. Mix well to make sure there are no lumps. Boil for 2 minutes after you add rava while stirring. Carrot Halwa - Easy To Make Sweet with Carrots and milk. Beetroot Halva - Easy to make Beetroot and milk sweet. Coconut Burfi - Quick and easy to make Coconut sweet.